Here's what I've made in the past couple of days. I'm really pushing it now, as the busy fair season is upon me. 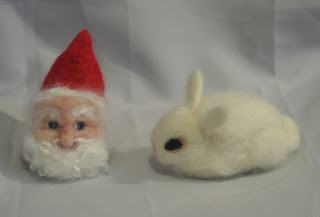 Here's a Santa gnome and a bunny. I'd not made any mammals in a while and I'm rusty at it. Took a while to get the right shape on the bunny. Here's what I was able to make from a cool sweater. It was small and had some mothy issues, so it's not much. But I loved the stripes. 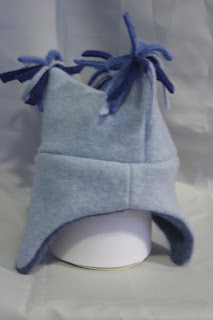 This is a hat I made for a special order: a grandma who has twin 3 year old grandchildren. She wanted blue and pink tassel hats for them. 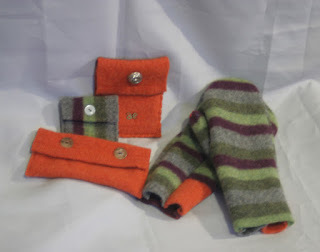 I added on the ear flaps so their little ears stay cozy, and lined them with cashmere so there will be no itchies. Here's another one. 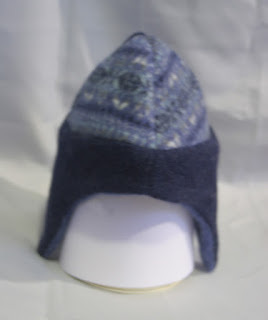 I really loved the Fair Isle design, but only had a tiny bit of it, so I had to use it on something small. It's lined with cashmere, too. 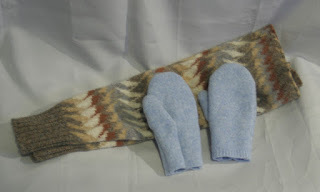 This is a pair of leg warmers and mittens to go with the tassel hat. I had some birds, but the pictures came out blurry for some reason , and as I'm bleary right now, it's not time to try taking them again. More again in a couple of days, God willing!